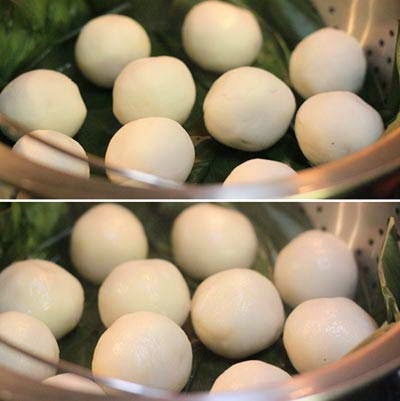 (Bánh Ít Trần) – Vietnamese Sticky Rice Dumplings comes from many delicious Vietnamese Cuisine. Today, I would like to introduce its process for all you guys. 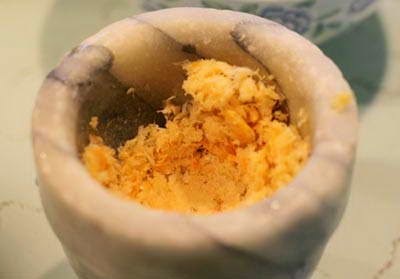 – Pour sticky rice flour on bowl, add more ½ teaspoon salt and pour slowly 100ml water (at 50 degree) or using fresh milk instead. 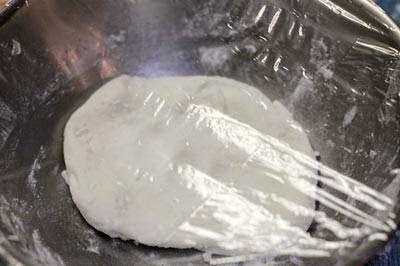 Knead well until it is soft and smooth (30 minutes). Cover it by nylon bag in 30 minutes. 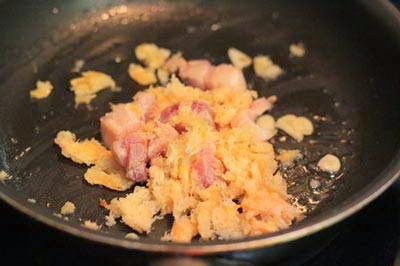 – Soak dried shrimps in water, smash quickly. 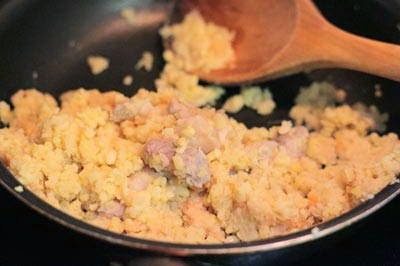 Clean well pork meat and slice small. – Heat 2 teaspoons oil, add more sliced purple onion and fry until it is fragrant. Then, add sliced pork and fry in 3 – 5 minutes and add shrimps into pan. 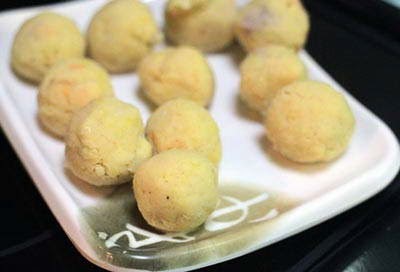 – Pour mung bean into pan, use wood spoon to stir gently. Add more salt, fish sauce, Maggie Seasoning Powder, pepper to suit your flavor. – Fry in 5 – 8 minutes until mung bean is dried, turn off heat. Wait to reduce heat and use hands to roll into circle shapes. 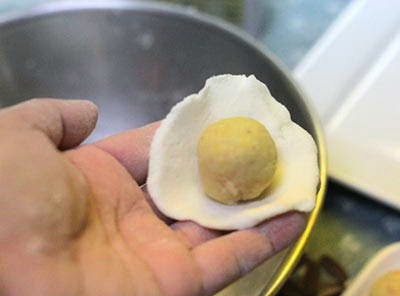 – Separate flour in step 1 into equal balls, press thinly and add mung bean on the center, wrap and roll carefully. – Continue until you finished all these balls. – Clean banana leaves, use napkin to absorb all water on leaves, arrange on steaming pot, spread a little oil on top and add one by one sticky rice balls on leaves. Steam with small heat in 15 – 20 minutes, sometimes open lib and use napkin to absorb water on lib. 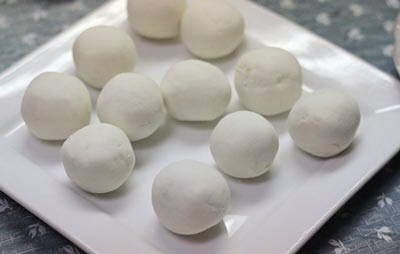 When they are cooked, spread a little mixture spring onion + olive oil on top of each ball. 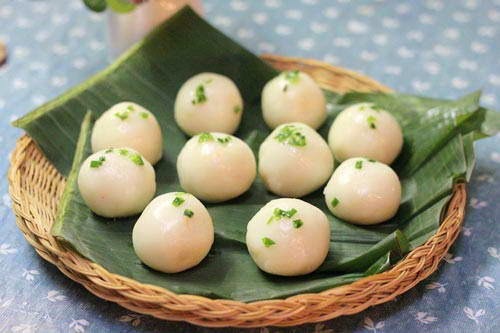 – Finally, you can serve Vietnamese Sticky Rice Dumplings with dipping fish sauce and pickled carrot + white onion. It is freaking awesome flavor.